The MEREPS Consortium includes seven organizations from four European countries. The following introductions will supply you with basic information about the partners involved, their activities and representatives in the project. Foresee Research Group - is an interdisciplinary think tank of young social scientists. Its research and project activities focus on promoting the principles and practices of alternative dispute resolution and helping the integration of marginalized groups in the society. Foresee Research Group Non-profit Ltd, with its training, program development, advisory, research and network building, wishes to contribute to the prevention and reduction of social inequalities. In addition, the group aims to spread the view and methodology of alternative techniques of conflict management and conflict resolution, to improve the objective survey of forms and measures of social exclusions, to aid the reduction and prevention of prejudices arising in society and to facilitate integration and equal opportunities for social groups in marginalized or challenging situations. As the MEREPS project’s consortium leader, Foresee Research Group is responsible for the technical and administrative implementation of the project. Concerning the Hungarian activities, Foresee is coordinating the Hungarian pilot project, including organising the training of prison staff as well as carrying out mediation and restorative justice activities in prison settings. Throughout the project Foresee’s priority is to stimulate the effective partnership and exchange between the various national and international parties as well as to coordinate the dissemination of the results. Dr. Fellegi has been the founder and executive director of Forese Research Group since 2008. Dr. Fellegi obtained a Master degree in social policy at the ELTE University and in criminology at the University of Cambridge. Her PhD research focused on the implementation of restorative justice in Hungary and was published in Hungary (Towards restoration – The implementation of restorative justice in Hungary by Napvilag Publishing House, Budapest, 2009). As a researcher of the European Forum for Restorative Justice she was coordinating a project on the possibilities for implementing restorative justice in Central and Eastern Europe. Besides chairing the Research Committee of the European Forum for Restorative Justice, she is lecturing at the ELTE and at other universities as well as working as a consultant for the Hungarian Central Office of Justice in the field of victim-offender mediation. Between 2002 and 2006 she represented Hungary in the COST Action A21’s Management Committee, actively participated in the Action’s research projects and has published several articles within the framework of the Action (downloadable from www.fellegi.hu). She is a board member of the National Association of Mediation in Hungary and of the Independent Academic Research Studies. Innokut Researching Ltd.— strives to promote balanced yet efficient cooperation and symbiotic operation between various role-players of today’s society and economy. The Innokut Nonprofit Ltd. Hungary is supporting Foresee Research Group in the financial administration of the project. The financial expert of the project is Mr. Zoltán Mersits, who carried out his studies at the Budapest College of Technology at the faculty of Technical Managament and Economics. He possesses an extensive experience and expertise in bringing together and managing - both financially and generally- funded projects of for-profit and non-profit organizations, and their consortiums that have received grants from EU funding programmes. In his past curriculum he has lead the umbrella project (Meta-Funding Programme) of the Hungarian Alliance of IT Companies, where 23 companies have received grants for employee-training and human resource development at the same time. As a financial director, he has coordinated the successful IKON (Interactive Local Governments and Communes Online) project of the ISociety Organization, which is a Hungarian organization of high public utility. At ITWare Ltd company, then later at Winsdom Research and Consulting Plc he was in charge of business development: Zoltán Mersits was responsible for the monitoring of funded Hungarian and EU programmes, the creation of well-grounded projects, and the complete and financial management of the granted projects all throughout their life. In this period (between 2005 and 2008) several EU-granted projects were successfully managed under his direction in Hungary: such as the retail system development project called SMS Online of ITWare Ltd; or the Innovation Project of Winsdom Plc called Expert software family serving public tendering; or other enterprise development projects of Fajro Ltd and Meló-Diák School Co-op Organization at Szolnok, Hungary. From 2007, Mr. Mersits acts as the Chairman of the Supervisory Board of INNOKUT Nonprofit Researching and Servicing Limited Organisation of Public Utility. Besides, he carries out financial management and consultancy at the accounting service provider for INNOKUT Ltd on granted projects. The National Institute Of Criminology (Hungary) - as Central Europe's major criminological research institute, aims to conduct research on crime, to improve the theory and practice of criminology, police science and criminal law, to contribute to the utilisation of the research results, and to train the junior prosecutors. The Hungarian National Institute of Criminology, as the professional leader of the project, is responsible for carrying out a quantitative and qualitative empirical research concerning the attitudes of inmates and prison staff towards restorative justice. Dr. Barabás studied law at the ELTE University in Budapest. She received a special Scholarship for Hungarian Academy of Sciences from 1989-92. In 1992-93 she followed postgraduate studies at the University of Fribourg in Switzerland. Her PhD thesis was a comparative study on alternatives to sanctions and on mediation. Since 1994 she is senior researcher of the National Institute of Criminology, and since 1997 Head of the Department of International Administration and Documentation. Since 1998 she has been working as Senior Official responsible for the Public Relation activities of the Institute. Dr. Barabás has conducted several prison-based research projects about attitudes of inmates towards their offence. Also, she has been the representative of Hungary in the COST Actions A21’s Management Committee about RJ developments in Europe. Dr. Windt studied sociology at the Pázmány Péter University Piliscsaba. She is a researcher at the National Institute of Criminology since 2002. She is a sociologist of settlement. She is dealing with domestic violence, situational crime prevention, postponement of the accusation and the possibilities of mediation. Independent Academic Research Studies (UK) — a youth-led social policy think-tank that empowers young people to have a voice and influence policy and practice that affects them.Through volunteering, youth-led work, training, skills-development programmes and research, young people at IARS aim to improve practices that affect them and as role models participate in society and support their peers and youth-led organisations and groups in creating a tolerant and equal society where young people are respected and valued. IARS is unique in its structure and the only youth-led social policy think-tank in the UK. IARS aims to serve as a model whereby young people, particularly from disadvantaged groups, come together to inform practices and policies that affect their lives, and support youth-led Third Sector organisations and others concerned with issues that involve them. IARS (UK) carries out a UK based research project on the post-sentence use of RJ with young offenders. IARS will carry out interviews with policy makers, correctional staff, and young people to identify emerging themes and examples of best practice. IARS is organising and hosting the study tour and first expert meeting in London in November 2009. Dr. Gavrielides is an expert on restorative justice and criminal justice with a tracked record of academic publications including his book “Restorative Justice Theory and Practice: Addressing the discrepancy” that has been published by the European Institute for Crime Prevention and Control Affiliated with the United Nations (HEUNI). Previously, he was the Human Rights Advisor of the Strategy Development Division of the Ministry of Justice (MOJ) and an academic at the London School of Economics and Political Sciences. Mr. Parle has been a research officer at IARS since December 2006. He has acted as an editor and consultant on a policy and research project funded by the European Union’s EQUAL programme, investigating the gap in service provision for London’s Black, Asian and Minority Ethnic homeless people. Mr. Parle has also fundraised, managed and carried out research for the Youth Empowerment Project (YEP); a youth led research and policy project examining the affect of human rights education on young people. University Of Applied Sciences In Public Administration In Bremen (Germany) — is a university specialised in law and security courses and research. The university hosts the Institute of Police and Security Research (IPOS), which is engaged in a variety of research projects dealing with restorative justice, prevention, and other related topics. Victim Offender Mediation Service Bremen (Germany) — is an NGO that offers a variety of services in the field of restorative justice. Among those are several mediation offices in urban trouble hotspots throughout the city of Bremen, a European funded project dealing with stalking and domestic violence and most recently the European funded MEREPS project. The German partners, the HfoeV University and the Victim-Offender Mediation Service in Bremen will carry out and evaluate victim-offender mediations in prison settings as well as will deliver an attitudinal research about the judiciary’s view towards RJ. Since 2002 Prof. Hartmann has been a professor of criminal law, criminal procedure and criminology at the University of Applied Sciences in Public Administration in Bremen (HfOeV) and vice director of the Institute of Police and Security Research (IPOS). Since 2004 he was member of the COST Actions A21 “Restorative Justice Developments in Europe”. He is also the chair of the TOA-Verein Bremen (NGO for VOM in Bremen) and together with prof. dr. Kerner he is the author of the annual reports on VOM for the German federal government. He is nominated as German representative at the EUCPN project and conference “European Best Practices of Restorative Justices in the Criminal Procedure” in April 2009 in Budapest. 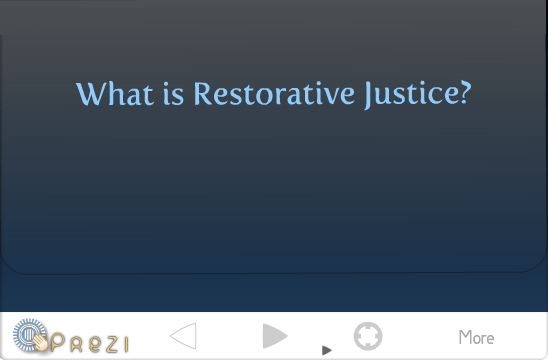 European Forum For Restorative Justice — helps establishing and developing victim-offender mediation and other RJ practices throughout Europe by stimulating open dialogue between RJ practitioners, policy makers, researchers and legal practitioners. The European Forum for RJ is the key actor in disseminating information and best practices about RJ amongst the European countries and in incorporating the European dimension into the delivery of the project. Karolien Mariën is a criminologist. She worked as a restorative justice adviser in a Belgian prison. After that she worked for the central psycho-social service: a service within the Belgian Ministry of Justice that supports and assists the people working with prisoners regarding the preparation for their reintegration into the community. Now she is the executive officer of the European Forum for Restorative Justice.